Bring Cajun flavor to your dinner table, no matter where you live! This recipe features chicken breast and sausage to satisfy your hungry family. 1. 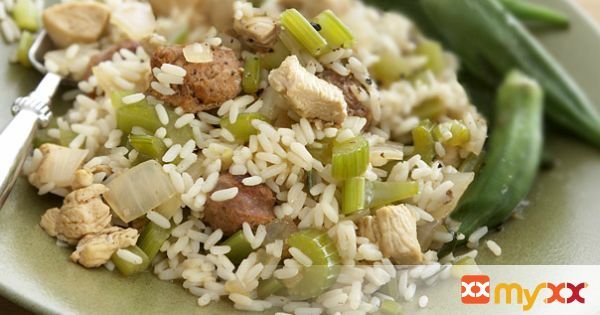 Combine rice, sausage, celery, onion, garlic, both broths, bay leaf, pepper, paprika and Worcestershire sauce in large skillet or Dutch oven. 2. Bring to a boil. Reduce heat. Cover and simmer 20 minutes. 3. Add chicken, cover and simmer until chicken is cooked through and liquid is absorbed, about 10 minutes.